1. Machine is suitable for bending steel pipe from 1/2”to 3”. 4. Fast and easy setup on the jobsite. 6. Hand pump with 1.8 meter hose allows operation from a distance, increasing flexibility and safety. 7. 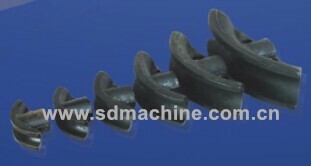 Supplied in a wooden case with a set of bending shoes and service pack. Size: 1/2", 3/4", 1", 1-1/4", 1-1/2", 2", 2-1/2", 3"